To aid overhead pallet stacking it is possible to fit the KOOI-REACHFORKS® with cameras. The camera is a solid high quality system that prevents damage of goods and racking but more important the camera system improves the working conditions of the lift truck driver considerably. A system that makes pallet handling more efficient and generates higher productivity. Especially for double-deep stacking we offer a miniature camera is completely integrated on side of one the telescopic forks. The advantage of this system is that the driver of the lift-truck is able to see how the reachforks are positioned in all circumstances. This is particularly helpful to the driver in double-deep stacking application making the operation safer and more efficient. Easy to service and maintain due to the simple system. No need for a filter because of certified components, covered parts and cables. Colour system gives more contrast and therefore a better image. Easy view 7″ wide LCD monitor with vertical or horizontal marker. LCD screen needs less space. Water resistance IP-69 camera is protected against high-pressure cleaning and steam cleaning. Shockproof to 30G, which guarantees a longer life. Heavy-duty protective cable chain between the palletstop and fork back. Total width of the right-hand telescopic fork with camera will be increased with ± 30 mm. 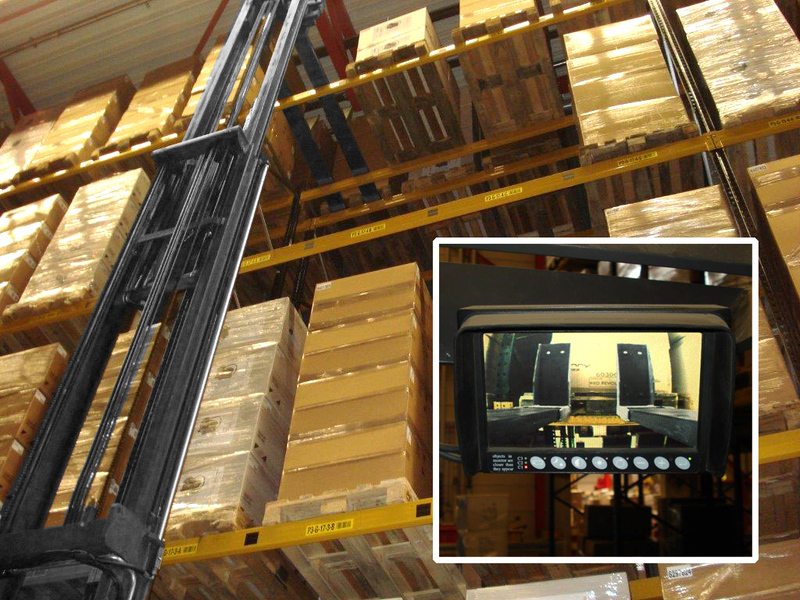 The colour camera with a 7″ wide colour LCD monitor gives the lift truck driver a perfect view at any height. This system will significantly reduce damages to goods and racking whilst also allowing labels to be read resulting in faster and more pallet handling. It is advised to use the camera on one-cylinder telescopic forks with special Y2 palletstops. Not only in standard warehouses the camera can be used. Also in cold storage applications the unique system is able to do the job without any problems because the camera unit is tested in extreme circumstances. Using the specially developed cabling system. The camera and monitor are connected in an easy and trouble-free way. The camera is a solid high quality system that prevents damage of goods and racking but more important the camera system improves the working conditions of the lift truck driver considerably. A system that makes pallet handling more efficient and generates higher productivity.